Tom Dinsdale Automotive, along with Mike and Jean Hamik of U-Save Pharmacy, continue their generous support of Grand Island Central Catholic. 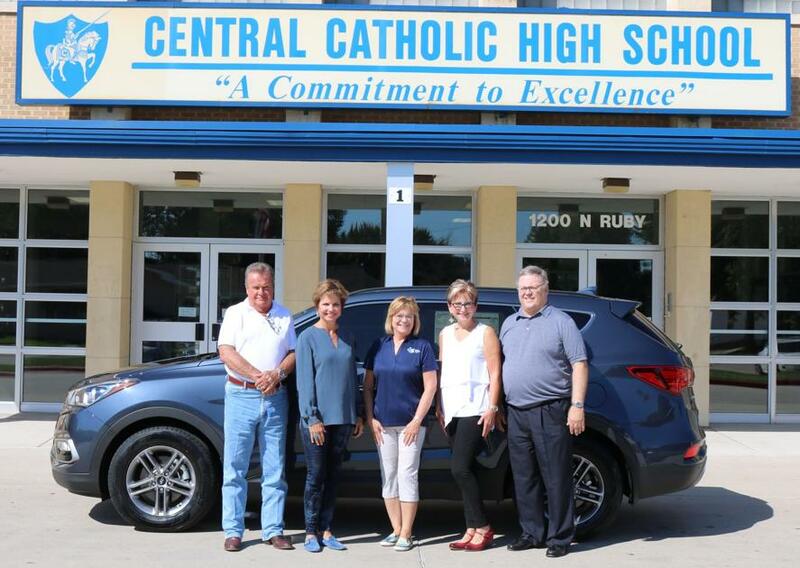 For the Central Catholic Development Foundation’s annual Knight fundraiser, they have come together to donate a 2018 Hyundai Santa Fe Sport AWD vehicle to be given away at The Knight in Wonderland. The foundation is gearing up for its annual Knight Dinner and Auction fundraising event, The Knight in Wonderland. The $36,000 fully loaded Santa Fe Sport offers luxury features such as keyless entry, alloy wheels, hands-free auto lift gate, panoramic sunroof, navigation, premium audio, cooled seats, heated seats and much more. A maximum of 500 tickets will be sold, at a cost of $100 each and will be available through Nov. 15 at the Central Catholic Development Foundation office, Tom Dinsdale Automotive, U-Save Pharmacy-South and from any Central Catholic Foundation Board member. The winning ticket will be drawn during the Knight in Wonderland at GICC on Nov. 16. Besides raffling the car that night, the event will offer live and silent auction items, additional raffle prizes, dinner and dessert. For more information about the car raffle tickets and/or attending The Knight in Wonderland event, contact the foundation office at (308) 382-5499.